Posting pictures and stoires to the web reaches a wonderful, new audience and is a great way to share things. For logistics, the EatYourRadio.org website is a WordPress Website. We can set up special permissions for students and adults who partner with us here at Eat Your Radio. With those special permissions, you can post stories to the website, and KGNU can then review them. KGNU has final editorial decision on what gets posted and what does not. When you’re in a partnership with KGNU, we are happy to work with you on the details of all of this. And it’s fun to see things posted, and share them. Some school districts are switching school-based websites to WordPress formants. If your school is one of them, you can look into partnering with KGNU to help you set up the site and teach your staff and volunteers about how to link to other sites, such as Eat Your Radio, and how to post sound, pictures and videos. We have helped Ashley Elementary in this way. 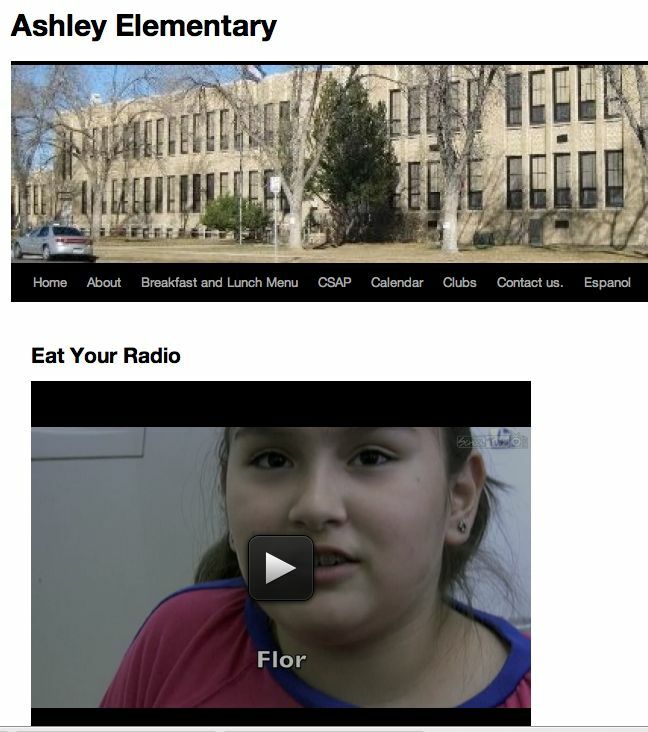 That’s a snapshot of their website, to the right, and as you can see, it includes an embedded video from the Eat Your Radio website. That’s easy to do! We can show you how.